If you follow this blog and you’re sick of seeing me twirl about in tulle skirts, then go ahead and unfollow me RIGHT now because I really don’t see an end to my tulle skirt obsession any time soon. Okay, don’t unfollow, because that would make me sad and I don’t like sad. Please? See? Don’t I look happy? That’s what tulle does to me. Every. Single. Time. While tulle skirts are fun and girly, and generally ” so cute,” I find myself wearing them, but still hanging onto my edge. My haircut sort of forces me to do so, but I also think it’s because I’m really getting to enjoy mixing my soft girly side with a more “rock” vibe. Hence, the moto jacket, and cage-style sandals. 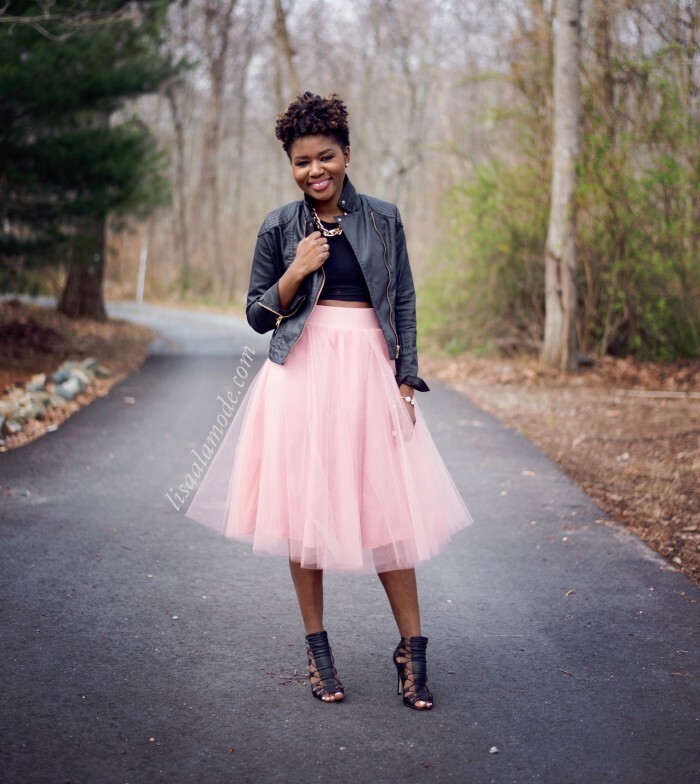 For More Tulle Skirt fun check out this post HERE, HERE, HERE, and HERE. I do hope that by now you will have been thoroughly convinced in pink tulle midi skirt magic. Join me! What are you waiting for?!? You look stunning! Love the skirt and the jacket! Girl this skirt is lovely, It’s unfortunate that I’m yet to rock this trend. I love how you edged up this girly pieces with the heels and your hair, perfect! rock it!!! and thank you! The skirt is lovely, I love how you edged it up with those heels, I think it’s your signature way of styling these skirt. Have I told you how much I love your hair?. 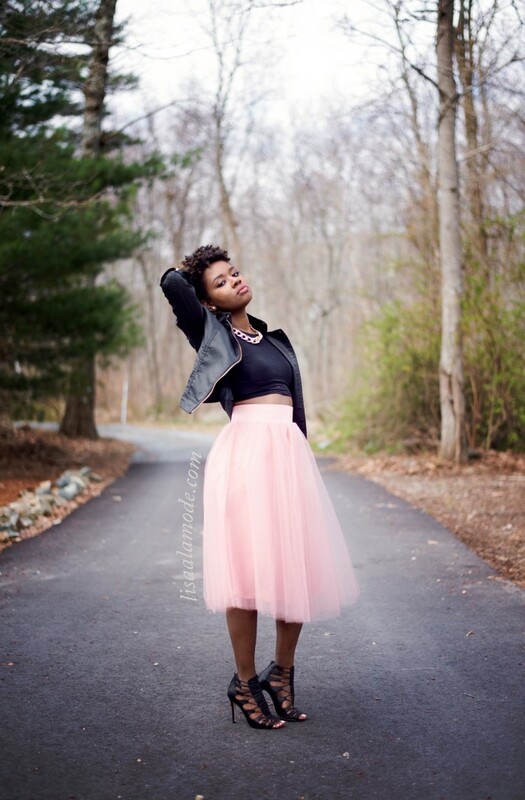 I adore this tulle skirt, the color is perfect! Thanks girl! And it was pretty cheap too!! Totally in love with this skirt on you, love how you styled it! You look so pretty! THAT is gorj! And you look spectacular in it, love the styling. I love it you always rock the heck outta your tulle skirts! I have a red one that I’ve yet to wear maybe soon. 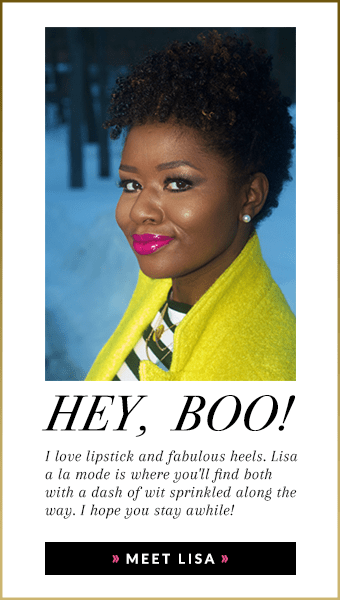 OMG Lisa! You look sooo pretty! 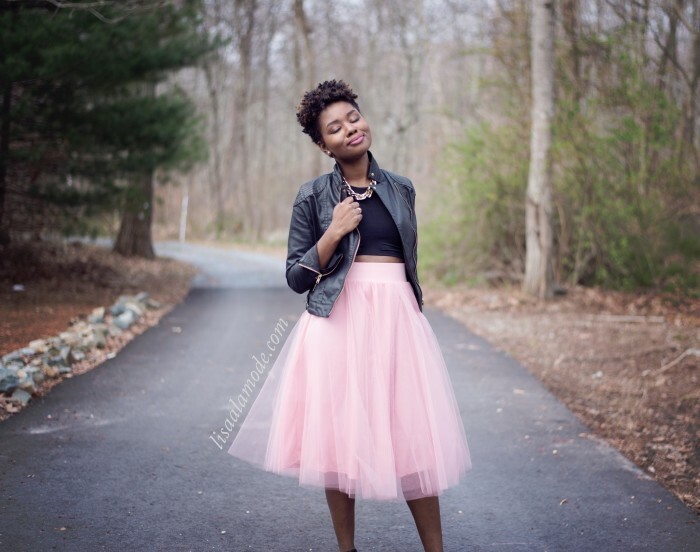 This tulle skirt is the bomb and I love how you styled it with the Moro jacket and the crop top! You look so fierce! Love love! I love, love, love this tough girl/cutesy vibe! I love how you rocked this outfit!